The facelifted model will go on sale this summer. Subaru has announced the 2017 Forester will be priced from $22,595 when it arrives at dealerships this summer. Costing $200 more than its predecessor, the facelifted model has new front fascia with a revised grille that is flanked by restyled headlights. The crossover has also been equipped with new LED taillights, restyled wheels, and a body-color rear spoiler on higher-end variants. Speaking of the latter, the range-topping Forester Touring starts at $34,295 and will be offered with a newly exclusive Sepia Bronze Metallic paint job. The interior receives a modest makeover as designers installed a new multi-function steering wheel and additional standard equipment. There are also several new options including a heated steering wheel, a Keyless Access system, and Saddle Brown perforated leather seats with contrast stitching. The Forester can also be equipped with an upgraded EyeSight system that has color cameras which provide a wider and longer field of vision. Drivers can also look forward to a quieter cabin as Subaru added additional sound deadening material, thicker door glass, and improved door seals which will help to reduce wind noise. Engine options carryover but models equipped with the 2.5-liter four-cylinder engine and the Lineartronic CVT continuously variable transmission boast a higher fuel economy rating of 26 miles per gallon city / 32 mpg highway / 28 mpg combined. The aforementioned Forester Touring also gains a new Active Torque Vectoring system. Note: Prices exclude a destination and delivery fee which ranges from $875 to $1,025. 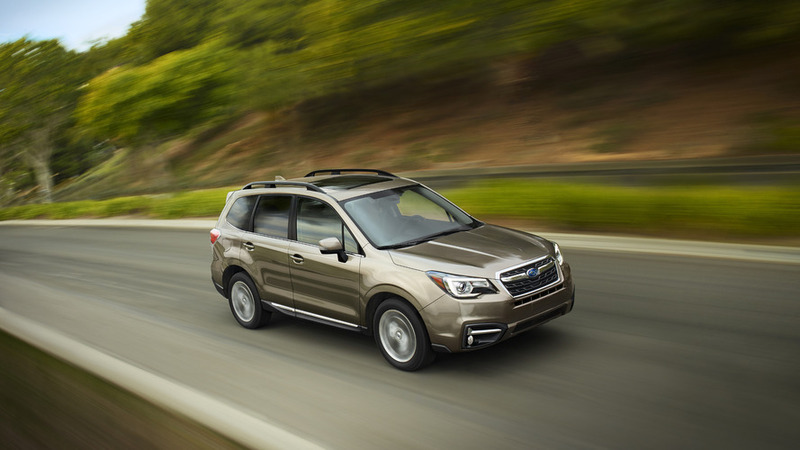 Cherry Hill, N.J. - Subaru of America, Inc. today announced pricing on the 2017 Subaru Forester line. The 2017 Forester models will arrive at retailers late Summer 2016. Debuting revised styling, new driver assist technologies, more interior comfort, and better fuel economy, the Forester has a starting price of $22,595. The exterior of the 2017 Forester receives several updates including a refined front bumper cover and a new hexagonal grille. The redesigned headlights have a sleeker look with Subaru’s signature C-shaped motif and a black inner bezel, while the rear combination lights also feature a prominent C shape with LED illumination. Combined, these new styling and lighting elements provide excellent forward visibility along with a more robust and distinctive look. All 2017 Forester models now feature an updated steering wheel design with intuitive audio, Bluetooth® and cruise control switches. Also new for 2017 is a quicker steering ratio for an improved feel. Additional enhancements include added soundproofing, thicker door glass and restructured door seals to reduce wind noise, underfloor insulation and an acoustic windshield which create a quieter, more refined interior. Two new aluminum alloy wheel designs have been added to select trims, each featuring a high-contrast black and machined finish. The new 17-in wheels are standard on 2.5i Premium and Limited models, while the new 18-in wheel design is standard on 2.0XT. The 2017 Forester 2.5i is available in standard, Premium, Limited and Touring trims and is powered by a 170-hp 2.5-liter 4-cylinder BOXER engine. A 6-speed manual transmission is standard for the 2.5i and 2.5i Premium, with the CVT available as an option. The Forester 2.0XT is available in both Premium and Touring trims and powered by a 250-hp 2.0-liter intercooled, turbocharged 4-cylinder BOXER engine. All 2017 Forester models come standard with Symmetrical All-Wheel Drive, a distinction from competitive models that come with front-wheel drive as standard and offer all-wheel drive as an extra-cost option. Priced from $25,495, Premium trims build from the base model and add as standard 17-in. alloy wheels, X- Mode® which also incorporates Hill Descent Control, automatic HVAC controls, body color rear roof spoiler and illuminated dual vanity mirrors. Premium Foresters now offer available power rear gate with auto close and height memory. For 2017, Forester received an update to Subaru’s highly-rated EyeSight® Driver Assist Technology, incorporating color cameras that provide a wider, longer field of vision. The revised system now includes Lane Keep Assist, which can gently guide the vehicle back to the center of its lane if sway is detected. Limited trim levels upgrade with silver metallic and gloss black finish center dash panel trim, body color exterior mirrors with integrated turn signals and leather-wrapped steering wheel. Blind Spot Detection and Rear Cross Traffic Alert also come standard on Limited trims. EyeSight-equipped models include High Beam Assist, Reverse Auto Braking and Steering Responsive LED Headlamps. 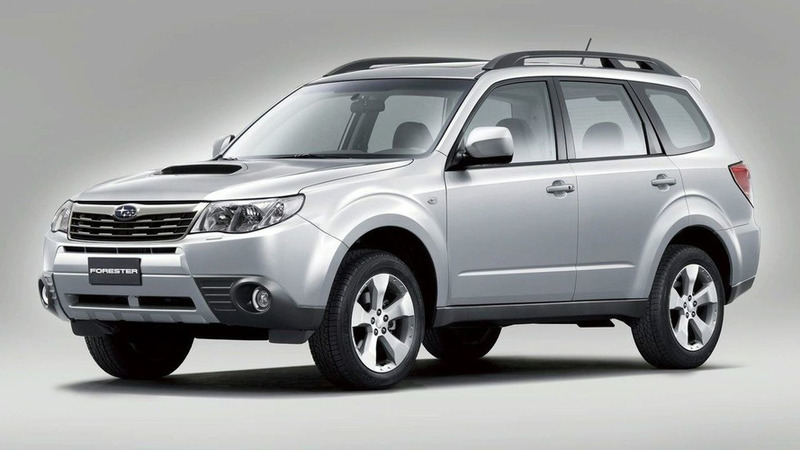 Forester 2.5i Limited models begin at $29,195. The top-of-the-line Touring models offer a new, exclusive Sepia Bronze Metallic exterior color. 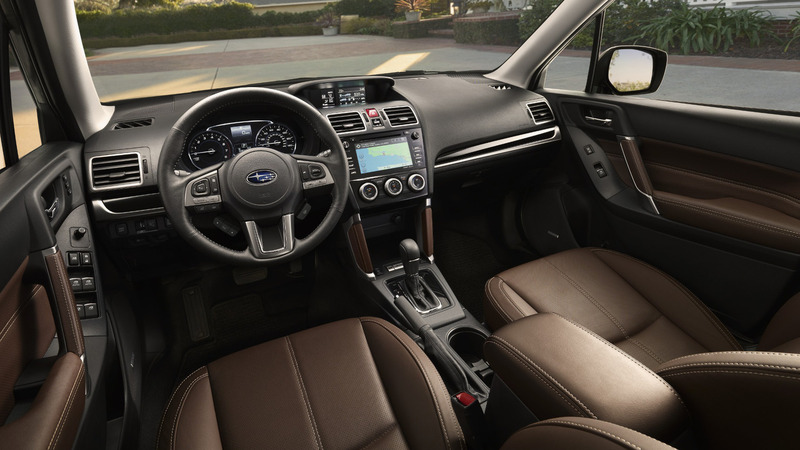 Inside, the revised Forester Touring offers an all-new Saddle Brown perforated leather-trimmed upholstery option with contrast stitching. This choice also brings matching brown leather trim to the door panels, center console storage box lid and other interior details. A heated steering wheel – a first for the Forester line – is now standard on 2.5i and 2.0XT Touring models. Additionally, Touring models have power driver’s seat with two-position memory, Steering Responsive Headlamps, and Keyless Access with Push-Button Start. Active Torque Vectoring, first introduced on the WRX and WRX STI, is now standard on Forester 2.0XT Touring with EyeSight. Reverse Auto Braking and High-Beam Assist are included on EyeSight-equipped models. Forester Touring is priced from $31,295. All Forester trim lines feature SUBARU STARLINK™ Multimedia systems that provide hands-free connectivity and entertainment services. The Forester 2.5i base model features the STARLINK 6.2” Multimedia system with a 6.2-inch single-touch gesture display and the Premium, Limited and Touring trims have a standard STARLINK 7.0” Multimedia Plus system with a high-resolution 7-inch LCD screen, Bluetooth® hands-free SMS text messaging and dual USB ports and adds SiriusXM Travel Link®. The optional STARLINK 7.0” Multimedia Navigation system features voice-activated controls and comes with three years of complimentary map updates as well as a 3-year subscription to SiriusXM Traffic® and SiriusXM Travel Link® along with four months of SiriusXM All Access audio service. Destination & Delivery is $875 and may vary in the following states: CT, HI, MA, ME, NH, NJ, NY, RI and VT. D&D is $1,025 for dealers in Alaska.